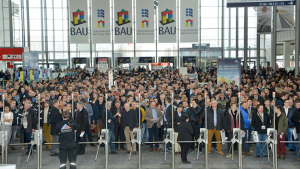 BAU 2019 was another record-breaking event. On an exhibition space totalling 200,000 square meters for the first time, 2,250 exhibitors from 45 countries showcased their products and solutions for the building sector. Visitor numbers reached 250,000, with the figures for visitors from outside Germany climbing to a new high of 85,000, from over 150 countries. This, deservedly, gives the status of BAU as the ‘World´s Leading Trade Fair for Architecture, Materials and Systems’.